A still from "Love Is Strange"
A still from Debra Granik's "Stray Dog"
The 20th Los Angeles Film Festival and its eclectic mix of movies wrapped up this past weekend. While the lineup wasn’t as strong as last year’s, it still featured plenty of gems. We’re only halfway through 2014, but we expect to see a few of these resurface during awards season. After nearly forty years together, Ben (John Lithgow) and George (Alfred Molina) have finally gotten married only to realize they must live apart due to financial troubles. Directed by Ira Sachs (Keep the Lights On, Forty Shades of Blue) the movie avoids big moments to focus on quiet details. Lithgow and Molina deliver understated, tender performances. This one will probably be a major Oscar contender. A man suffering a midlife crisis (David Dahlbom) goes to stay with his aunt, who runs a home for pregnant teenagers.What starts at a nicely observed look at how the girls deal with each other and their shared troubles takes a disappointing turn in its last third when the focus shifts more to a love triangle. This delightfully absurd comedy stars Michael Fassbender as a performance artist and musician who always wears a giant fake head. The exploration of art and what it means to an artist is anchored by Fassbender’s virtuoso comedic act. When the movie gets more serious, the vibe sours just a bit but the overall effect is pleasant. 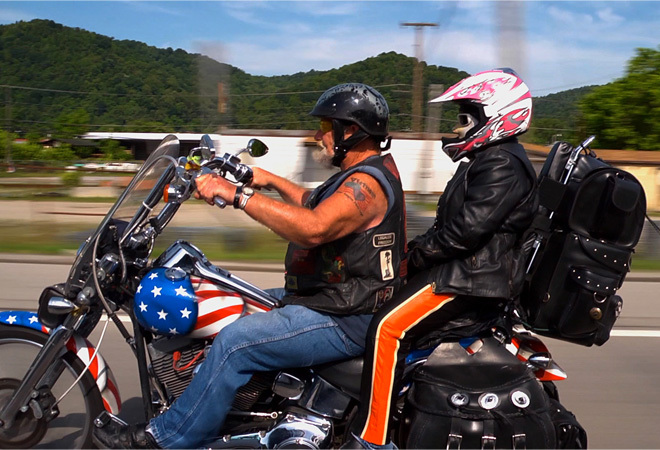 Debra Granik’s documentary about Missouri biker Ron “Stray Dog” Hall avoids every stereotype you can imagine when it comes to documentaries and bikers. The mundane affairs of this seemingly simple man make for absorbing material, thanks to Granik’s sharp eye for naturalistic filmmaking. It’s a heartfelt and funny look at rural life. This documentary chronicles the struggles of a North Dakota pastor as he attempts to shelter the migrants who come to his small town, over the objections of many residents. An utterly of the moment piece of work, the movie touches on a host of issues the effects of the recession, religion, charity. Wherever you think the story is going, you’re probably wrong. Are you a fan of Orange Is The New Black? This documentary dissects the institutional prejudice that doomed a group of women to prison. The story hinges on a 2006 Greenwich Village case in which a group of lesbians retaliated against a man who harassed them and were branded a “gang” and charged with perpetrating a hate crime. This is the perfect piece for the age of “stand your ground” laws. Ten years ago, director Darius Monroe robbed a bank. Now, he’s speaking to friends, family members, victims, and even prosecutor to trace how he went from top-notch student to criminal. While the execution can be rough, the material is endlessly fascinating. There certainly aren’t many other movies like it. Mark Defriest would have been in prison for four years, but he kept trying to break out. Instead, he’s been behind bars for more than thirty years. Defriest is a genius and in another life he could have done great things. He’s a character unlike any you’ve likely seen before, and his story deserves the Hollywood treatment.